Acupuncture is a part of Traditional Chinese Medicine (TCM), one of the oldest continuous systems of medicine dating back 4,000 years. It is the most commonly used system of healing in the world. Acupuncture treats on an electrical level. Living tissue has an electrical charge. In the West it is called galvanic current. TCM refers to that current circulating in the body as Chi. The purpose of acupuncture is to bring “harmony” to Chi or balance to that electromagnetic energy resulting in reduction of pain, increase in function, and circulation of blood and lymph. There is a charted pathway over which the Chi flows. This is a network of pathways called meridians, which are named after the organs they pass through or to. The needles act as antennae to therapeutically redirect the Chi toward harmony and balance. The World Health Organization (WHO) lists 100 conditions that respond to acupuncture. The first visit usually begins with the doctor taking a detailed history. After review, the doctor will begin diagnosing your ailment. Palpation (to explore by touch) of various acupuncture points on the body, a meridian scan may be performed by the doctor to individually test and quantify the amount of chi in each meridian. A printout of the test will be give to you so that you will further understand you body’s energy. Is treatment painful? Acupuncture needles are extremely slender – #36 gauge – or filamentous with no injection. They are not shots. The patient feels a tap as the needles are inserted with a sensation of a dull tingle or ache. This is the sensation of Chi indicating the antenna is doing its electrical work. 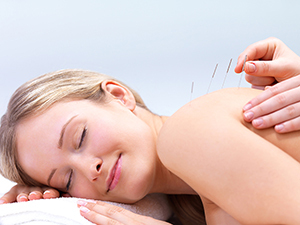 The overall experience of acupuncture treatment is pleasant and relaxing. The after effect is a sense of well being within your own skin which lingers for some time after the treatment. First visit consists of Electro Meridian Imaging Examination for $50 and the first acupuncture treatment is $60 for a total of $110. Subsequent visits are $60 each. The number of treatment sessions depends on the seriousness of your condition. A typical course of acupuncture treatment is 12 sessions, although significant improvements can occur after just a couple visits. Acupuncture services at Westside Chiropractic are provided by Dr. Gary Gamache, who has practiced chiropractic since 1978 and acupuncture since 2000. He is a Fellow and Diplomat with the International Academy of Medical Acupuncture. Call 342-4333 for your appointment and discover how acupuncture can help you.